Big Blue – my avian nemesis! Over the past few years, I’ve become an avid birder, at least from the standpoint of photographing the different species I see and trying to get interesting shots of their behavior. And while I’ve grown to love the beauty in each type of bird, there is one particular individual that I would rather not see in my yard. What has caused this aversion, you might ask? It’s related to my pond and fondness for the fish that have populated it. At one time, I had a lovely group of goldfish, butterfly koi, shubunkins, comets and one medium-sized koi, whom I named Big Guy (or Girl, depending on my perception that day). 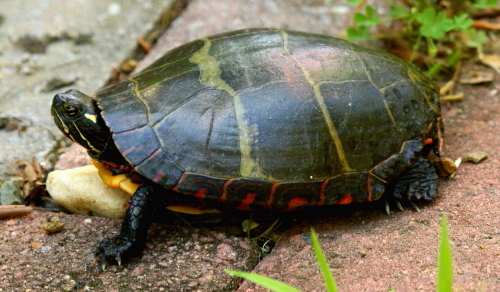 The first predator to get some of them was a turtle, who I admired near the pond one day, not realizing that it would go into the pond and then not be able to get out. 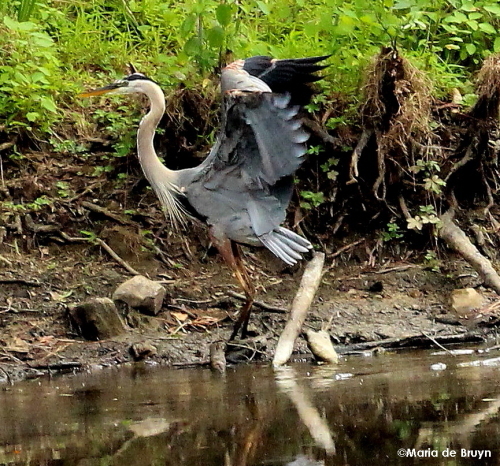 But then my real nemesis appeared – Big Blue (a name given by my neighbor, Kevin), a great blue heron (Ardea Herodias). 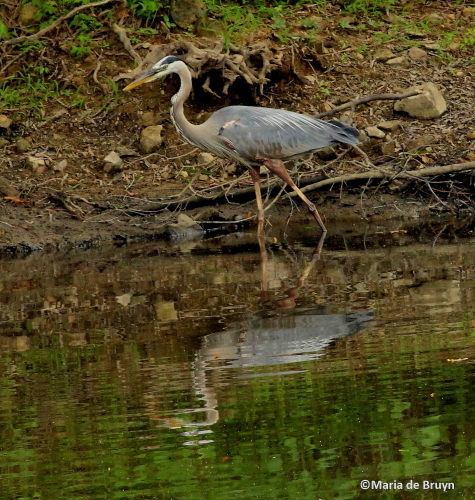 I had seen Big Blue at a large neighborhood pond and admired the grace of this large bird. However, the first time Big Blue visited my yard – to my knowledge – I caught sight of him (or her) standing in my small pond with one of my biggest goldfish hanging from his beak. I ran out into the yard, uselessly yelling for him to drop the fish. He stared at me and didn’t move until I was about three feet away – impressing me with his large size. (He was only about 6 inches shorter than me!) Then he lifted off with his prize meal. 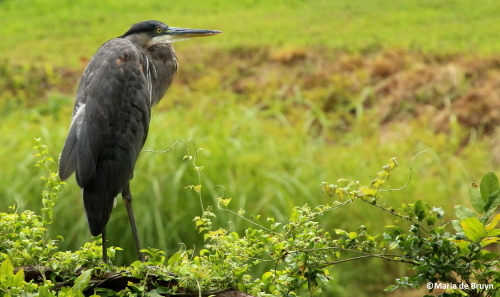 Great blue herons, the largest North American heron species, have a varied diet that includes small fish, as well as shrimp, crabs, rodents, other small mammals, frogs, salamanders, lizards, snakes, crayfish, dragonflies, grasshoppers, aquatic insects and even small birds. Their main hunting technique is to wade slowly in shallow water, sometimes diving headfirst into the water to quickly spear their prey with their sharp long bills. Covering my pond with netting was not an option. I had used netting to protect some plants and then had to rescue a small bird and an anole that had gotten tangled up. 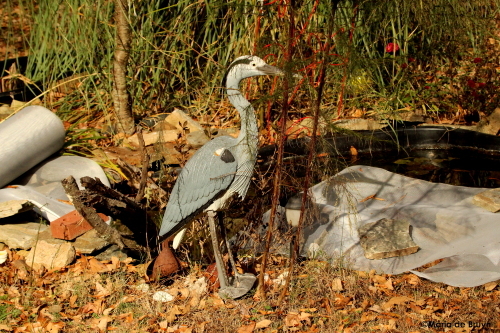 The owner of the store where I bought my fish (sadly closed now after many decades of running their family business) recommended I buy a life-like statue of a heron to position by the pond. 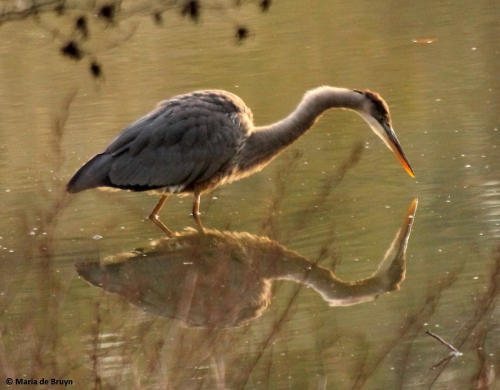 He had done this at his own pond and said it kept the herons away as they are solitary hunters and don’t want others in their territory. He said Big Blue would see the statue and fly on. So I installed the statue, changing its position from time to time. This seemed to work for many months but the past weeks I was very busy and didn’t change the stationary bird’s place. Then I noticed that my family of three bullfrogs were gone and Big Guy had gone missing (all the fish would come to the surface when I gave them pellet meals and Big Guy was gone. 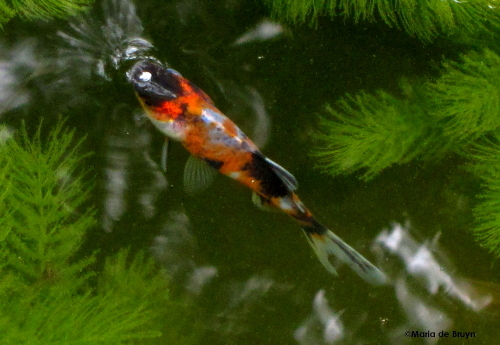 A gorgeous red, black and white goldfish with wavy fins was also gone. Inexplicably, the statue was also facing a different direction! Apparently, Big Blue must have had a tussle with the imposter and discovered he was not real, leaving him free to take up fishing in my pond again. I realized this about 2 weeks ago, when I saw Big Blue at the pond’s edge. I ran out to chase him off and he flew up to a neighbor’s tree. Now the pond is partly covered with some metal fencing laid over one end; it has tiny holes so no animals can get caught in it. The fish can hide under that and the smaller birds can still perch on sticks to get a drink. As it’s getting colder, the fish are also going into hibernation so – hopefully – they will make it through the winter! I have never seen Big Blue with a mate at the large neighborhood pond and sincerely hope that he will remain a bachelor. 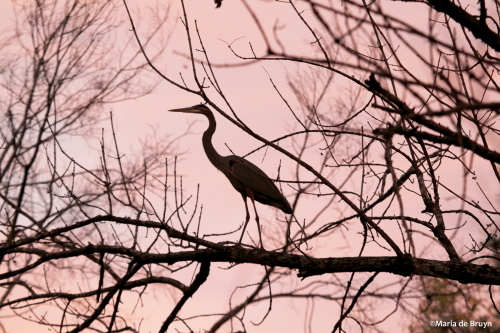 I admire his beauty but don’t want a family of herons using my pond as a restaurant! 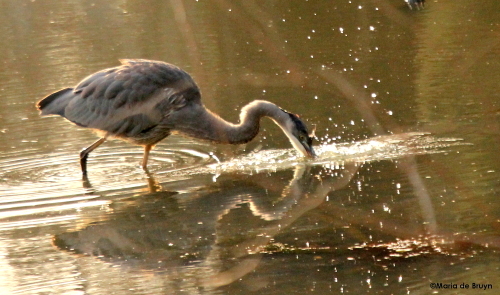 This entry was posted in Animal behavior, Birds, nature and tagged Ardea Herodias, behavior, bird, feeding, fish, great blue heron, nature, pond, urban environment, wildlife by Maria dB. Bookmark the permalink.